NOTE: Due to some severe political differences between the owners of The Generator and their choice to use their coffeehouse to publicize these views, I will no longer support The Generator with my presence or my purchases. In the wake of A-Kon, many Steampunks from the area are attempting to organize and actually make Steampunk in DFW something worth mentioning. I’ve been watching the plans of a couple of different groups to meet develop with marked interest. Interestingly enough, two of these groups independently decided that they were going to meet at The Generator, a coffee shop in Garland, TX. But apparently Garland did some growing up while I wasn’t looking. The Generator really is an independently owned Steampunk themed coffee shop, and it sells organic Fair Trade coffee. That’s very two very positive points as far as I’m concerned. Nothing makes a cup of coffee more enjoyable than knowing that it was ethically produced. They also have a decent schedule of events that the community can attend and display the artwork of local artists. All of these aspects are making me very excited for the Steampunk meet-ups planned at it’s locale. One does have a solid date, July 17th at 3 PM. You can read the thread to get this group organized here on Brass Goggles. The Generator is open from 7 to 11PM Monday through Saturday. While I was sitting in line for hours for the Abney Park concert, I was randomly given a flyer by someone for a Steampunk themed game shop in Richardson. Admittedly, at the time, I didn’t pay much attention to the flyer. I was way too excited about the concert to think about anything else at all, really. Fortunately for the person handing out this information, I was together enough with it to slip it into my belt pouch where it sat until I starting gathering all of the business cards and other Steampunk goodies I had gathered throughout the course of the weekend so I could share them all with you. And after finally reading the flyer and paying even the smallest amount of attention to it, I became very excited indeed. The Gamer’s Realm is a Steampunk themed gaming store in Richardson, TX. They carry a variety of table top and strategy games, miniatures, science kits, etc. They even have a meeting room that can be reserved for private gatherings. Sometime soon, I’m hoping to drop by and check this place out for real. In the meantime, I wanted to let you all know about it. If you happen to make in there before I do, let me know what you thought of it! The very notion of a Steampunk gaming store anywhere in the DFW area excites me to no end, is definitely an establishment I would like to support! This evening (finally) starts the series on merchants whose wares impressed me at A-Kon and had business cards to give me so that I could follow up with them here at Trial By Steam. First up, is Scarlett’s Corset. I saw these corsets at A-Kon and was very much impressed by the workmanship of the corset. Sometimes, it’s hard to tell from just an online picture how well made and supportive a corset will actually be when worn. And a corset is one article of clothing that one should not causally approach. It’s a very confining garment which literally changes the way the wearer breathes. Lacing a corset too tightly can cause one to pass out, and if done over a long period of time, can actually shift the shape of the wearer’s body and internal organs. So, corsets are not to be taken lightly. If you should choose to wear a corset, make sure it is one that is well constructed to your body’s specific dimensions. What’s even better for my readers in the DFW area is that Scarlett’s Corset is a locally owned business. So, if you missed the opportunity to buy one of these at the convention, you haven’t missed the opportunity to be measured and fitted by the maker of the corsets so that you can be absolutely sure that the corset you buy is properly suited for your body. For information on sizing a corset, click here. For my out of region readers, however, fret not! Scarlett’s Corset’s tours the nation sporting their wares at many a convention. Click here to see when they may be coming to your part of the US to witness these wonderful articles of clothing for yourself. Lifestylers– Lifestylers see Steampunk as a lifestyle (duh). They believe in a strong political element to Steampunk and are living the Steampunk life on a daily basis. The have huge amounts of money to spend on Steampunk, drive modded cars, live in Victorian manors, and look down on everyone else. Cosplayers– Cosplayers “dress up” in Steampunk fashion. They often have alternate characters with back stories that make up their Steampunk persona which is entirely separate from their real life. Dark Steam– A considerable portion of Steampunk also appeals to the Goth community. Even Abney Park used to be labeled a Goth band for lack of a better descriptor. In Dark Steam, black is the primary color of choice, rather than the brown of traditional Steampunk. They also tend to have a darker outlook than Steampunks. Purists– Are obsessed with functionality and authenticity. They hate plastic and items that ultimately don’t have a function. If its only purpose is to look cool, Purists don’t want to have anything to do with it. Makers– Are the inventors of Steampunk. They make all of the cool clothing and gadgetry that is the hallmark of the Steampunk look. They cannot go into a store without thinking about items as components to the latest Steampunk project. Ooh Shiny– Nearly everyone who likes Steampunk falls into this category. These are the people who like Steampunk because, well, nothing quite tops cool like shiny brass. I think that this is an interesting list, though the presentation of the lifestylers did offend me a bit. I felt his view of lifestylers was a bit distorted. I see myself as a Steampunk lifestyler. I live the Steampunk life every day in the music I listen to, the things I buy, and the political movements I support. I do not, however drive a Steampunk modded car, live in a Victorian manor, or have exponential amounts of money to spend on Steampunk. I work a very low paying job wherein I am not allowed to wear clothing outside the explicitly business professional. Does that make me any less of a Steampunk lifestyler? I personally don’t think so. I always find ways to slip Steampunk into my wardrobe, in the form of a piece of jewelry or some edgy thigh high stockings, but there’s a point where my budget and reality puts a stop on making all aspects of my life Steampunk at all times. Believe me, though, if a path presented itself to me wherein I could be Steampunk all of the time, I would do it. Perhaps one of the things that disappointed me the most about A-Kon was realizing just how many people view Steampunk as a cosplay event. As a lifestyler, I can’t understand how you can approach Steampunk as a dress-up party. It is the angle through which I approached Steampunk which makes it hard for me not to view Steampunk as a lifestyle; much of what I was doing before I heard the word was Steampunk, and having a name to call it gave me a social and cultural niche to frame my viewpoints and actions. I suppose I’m also something of a purist. I like to know that all that fancy gadgetry you’ve created actually does something other than look nice. If Steampunk wants to be seen as legit, I personally feel that functionality is important. There’s nothing quite as disappointing as admiring a Steampunk gadget only to realize it’s only for looks. What do you all think about these different subsets of Steampunk, and where do you fall? This really interests me because of the discussion going on at the Great Steampunk Debate right now and the difference between the two narratives. Whew, what a week! Sorry for the delay in updating, folks. This week has been terribly rough and containing far too many after-hours projects a row. But now I’m back and very excited to tell you all about the wonders of A-Kon 21. Thursday night was Registration night which naturally meant standing in a long line to receive my badge. I had just come from work and picking up a friend who flew in from MINNESOTA to hang with me for the weekend. It just so happened that I managed to fall in line right in front of a Dieselpunk named Larry and his charming wife and we became fast friends. Over the weekend, we learned that we lived relatively close to one another and that we had a number of of interests (besides Steampunk) in common. Click on the photo to check out Larry's blog! Friday I wandered about A-Kon for a bit and browsed the various merchants wares. I picked up lots of business cards of products I liked so that I could show them to you all in future blog posts! Friday was the official start of Steampunk events, and the first one was a “Steampunk 101” panel led by the Sky Dogs and the Delirium of Grandeur. 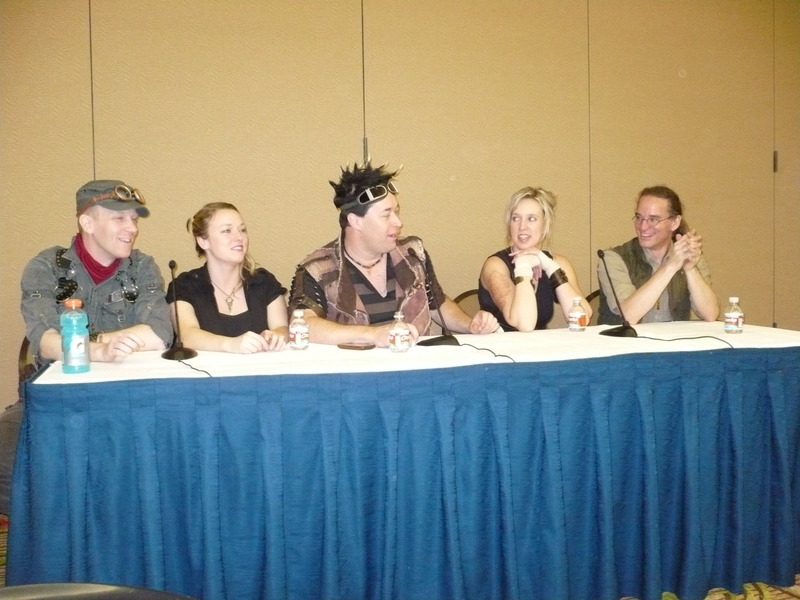 At this panel, they discussed what they thought Steampunk was and offered up various categories of Steampunk. I thought the panel was interesting, especially when compared to the current direction of the Great Steampunk Debate. There certainly are a lot of different opinions and perspectives on what Steampunk means to people. I promise I’ll write a post later on this panel. Later that evening was a Steampunk Tea Social which sounded lovely on paper but in reality was made a bit uncomfortable by the lack of tables and chairs. Also, hot beverages are usually not the drink of choice for those wearing many layers in the 100 degree weather of a Dallas summer. I chatted with Larry and his wife and a couple of new acquaintances who were pleasantly charming. There was an a Capella group there to provide the entertainment for the night, but they seemed to lose everyone’s attention after they sang the same song four different times. Imagine that. And just when I was starting to worry about the future of this convention, in walked Captain Robert, who I’m sure you all know is the lead singer of Abney Park. There he was, just hanging with us. I couldn’t believe it. 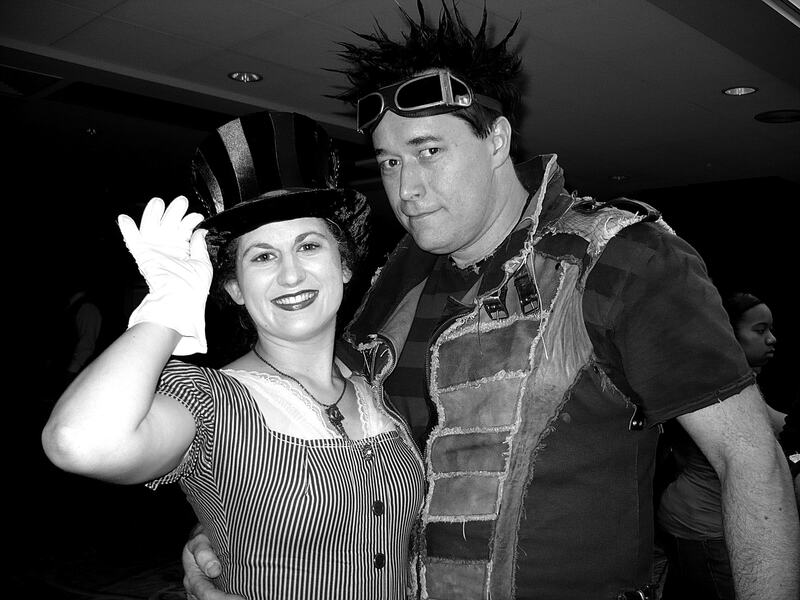 I had not expected to see any of the members of Abney Park until Saturday night at the concert, and yet, there he was! I was literally shaking with excitement- a fact that Captain Robert did not fail to overlook as I took a photo of some of my new friends with the Captain. “I know,” I said to myself. Saturday was only more epic. At a Q&A session with the whole of Abney Park, I was asked by Nathaniel where I got my top hat which is quite the compliment considering how many top hats they see… After the panel, I got the email addresses of the band so that I could forward the information on to them. Wheee! So then, the concert. Oh god, the concert… I sat for three hours to get a front row view of the action (with a little help from my friend Larry, who rocks) and it was positively amazing. Abney Park was everything I could have hoped they would be, and more. It was amazing! They played all of their hits… in fact the only one I really missed was Under the Radar, a personal favorite of mine. By the concerts nearing end, however, everyone was screaming for them to play Airship Pirate, to which Captain Robert informed the crowd that they could not play it because they did not have their violin stand… unless… someone would hold the violin for Nathaniel during the song. And guess who got picked to come up and rock out with the band! (I’m still searching for a good photo of this. If anyone finds one, please let me know…) Nathaniel even gave me his pick that he played the night with after the song was over. In autographs after the concert, I got a hug from Nathaniel and he asked me to add him of Facebook which was another squee moment. I can’t wait to see them again at SteamCon. So, needless to say I had a spectacular time a A-Kon. 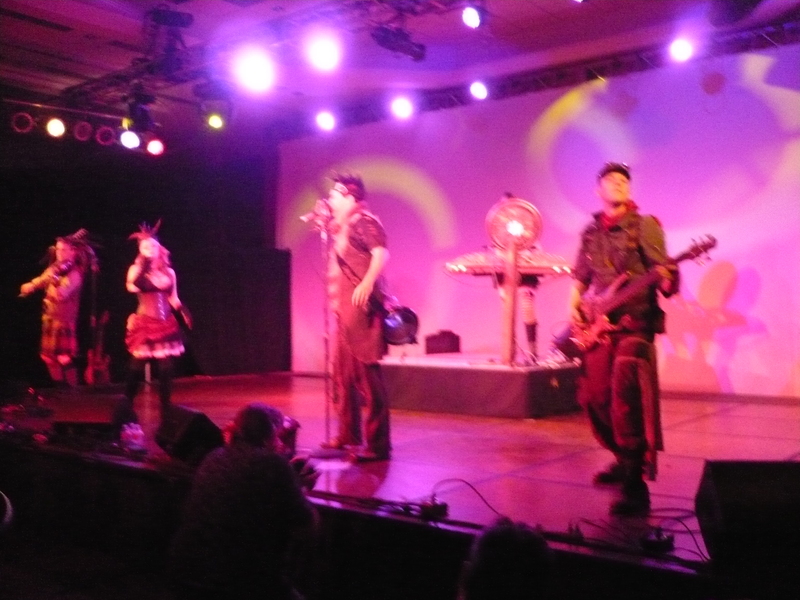 I met many wonderful Steam and Dieselpunks and I can’t wait to see Abney Park again. It was hard to go back to work after such a Steampunk weekend, but fortunately, I have SteamCon on the horizon. I doubt it could come fast enough, though!